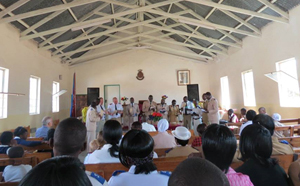 The Salvation Army is an integral part of the Christian Church, although distinctive in government and practice. The Army's doctrine follows the mainstream of Christian belief and its articles of faith emphasize God's saving purposes. The Salvation Army is energised by faith in God, revealed in the life, death and resurrection of Jesus Christ and powered by the Holy Spirit. All life, activity and people at Chikankata are a beautiful gift from God and we come together to worship and celebrate life in the fullness of God’s richest blessing through our lives in Christ. Worshipping and serving God is therefore a very important part of life at Chikankata. There are two Salvation Army corps within easy accessone - one is right outside the seminar centre where visitors often stay and everyone is warmly welcomed! Worship is very lively with a band and various singing groups and dancing is very much the norm. Visitors will find it impossible to miss the opportunities to worship God at Chikankata and you don't have to wear a uniform to attend The Salvation Army - EVERYONE is welcome to attend these meetings. * Additionally, on a Sunday morning the Chikankata Secondary School meets for vibrant worship in the main school hall and in the evening the hospital community meets in the Prayer Room, near the hospital’smain entrance. The Corps has a project that it’s running for it to generate income and sustain its financial obligations.